Both in the commissioning of the twelve spies and this narrative of them setting out on their mission, the Hebrew word is used to describe the purpose of the exercise. Moshe sent the spies, on behalf of the people, to reconnoitre the Land that the L-rd was giving them; they went up into the Land and spied it out. 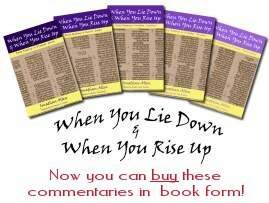 But the English translations conceal a wide variety of meaning in the Hebrew that can tell us a lot about how we look at people or events around us. The basic meaning of the root is "to go round or about" - one might almost think it was related to the English word 'tour' which it sounds like! - and from it are derived five different meanings. Firstly, it can mean to go or travel about as a merchant, inspecting the various goods that one might purchase, buying and selling merchandise or produce; a commercial trip or venture. Secondly, the word can be used to mean searching out, exploring or investigating; there is a famous rabbi known as "HaTur" because of his precise Torah commentary investigating the hidden connections between the words in the Hebrew Scriptures. Taking it a step further, the third meaning is that used in our text: to go about as a spy, to spy out; now the investigation has become covert and the seekers themselves are to some degree hidden. Another stage on reaches the meaning of to think or purpose, to plan or devise - as seen in Kohelet 2:3. One traditional Orthodox view of the ten spies who returned with a bad report is that they had planned to do so all along (see Tanchuma 5; Sotah 34b). Finally, the last meaning is to go astray -as found in the closing verses of this week's parasha when the L-rd instructs Moshe about the tztizit, fringes, to be worn, "so that you won't go around wherever your own heart and eyes lead you" (B'Midbar 15:39, CJB). What starts out as a simple every-day exercise to buy or sell can be taken so far that it ends in deceit, plotting and going astray. In the Sermon on the Mount, Yeshua tells the talmidim, "If your right eye makes you sin, gouge it out and throw it away! Better that you should lose one part of you than have your whole body thrown into Gei-Hinnom" (Matthew 5:29, CJB). The eye is one of the most amazing organs in the body: not only light sensitive, but able to focus, discern colour and shape, and with a depth of view for detail and scope that it cannot be matched by any mad-made device. Yet it is with the eye that we see things that we do not have or that we should not see; the eye can create desire if allowed to freely roam and lead us into sin. As the spies sent out to report on the Land before them should have stayed focussed on their objectives and not allowed themselves to be led into plotting and going astray, so we must govern our eyes and what we see with them. Application: It is easy to spend time gazing around, either with the eyes or the mind, day-dreaming and imagining what might be nice to do or to have. Next time you find yourself doing that, compare your thoughts with the word of G-d on the subject.